Happy New Year! I have a couple of year recap posts coming up, but for now, I hope everyone is off to a great start for 2016. This year for teacher gifts I made a Christmas Jam. I had copied the recipe out of a cookbook I checked out of the library last spring. It's a miracle I remembered it when it came time to make teacher gifts. The jam has strawberries and cranberries in it. Along with some mini loaves of homemade bread, I thought they made cute little gifts. Readers, did you give or receive any unique homemade gifts this year? I just made some cranberry jam...I like it! I didn't receive any myself this year. Mrs.PP did as my mother made her a huge quilt with our own hand spun batting (sp?) and such. I gave a lot fo honey as presents though. Looks delicious, nice presentation! Enjoy your new year! Very cute gifts!!! I'm sure the teachers loved them! Ooooh, Blissful teachers . . . what a terrific gift!!! Happy New Year, Lisa and family. I wish only the best for you all. Those do sound like really nice gifts! My only homemade gift this year was a scarf from my aunt. It has definitely kept my neck warm in this new cold climate! Very thoughtful gifts for the teachers. I didn't make anything this year. Those were the coolest gifts ever! I made the wrapping paper, a washer necklace for 1 of my nephews, lip balm with Isaak, wake up spray with Mica, and my husband made a flyer from Star Wars from a dollar for another nephew. Great idea! No homemade gifts this year. Last year my daughter gave us ceramic mugs that she made in a class. 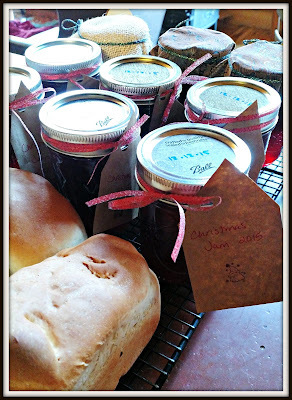 That is a cute idea to give bread and jam as gifts. I bet everyone loved it.